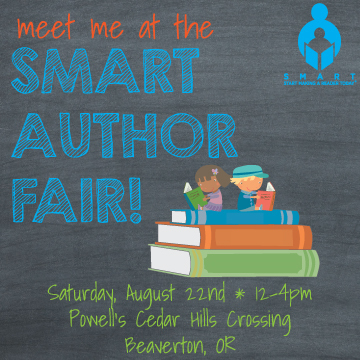 On August 22nd, from 12-2pm, I’ll be signing at the SMART Author Fair! See below for more details, and click on the image to see the event on Facebook, where you can RSVP to the event. There will be many other authors in attendance, including Rosanne Parry (Heart of a Shepherd, Written in Stone), Heidi Schulz (Hook’s Revenge series), and Victoria Jamieson (Roller Girl)! Hope to see you there!